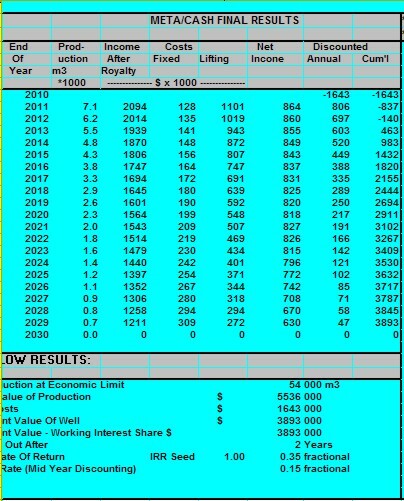 To calculate a cash flow estimate for a well or a pool, we need a production profile from actual well performance or a decline curve analysis run at equal time increments. 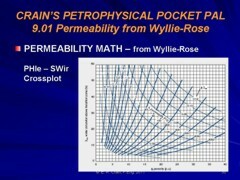 It is easiest to generate a monthly flow rate, monthly income, and monthly expense table, based on the following equations. The annual decline rate D can be found by decline curve analysis or from the simpler production projection / economic life models elsewhere in this Handbook. This number must be negative for all real wells. Monthly discount rate on money. Monthly production at constant rate. Monthly production at declining rate. To obtain the total present value of the well, the individual monthly discounted cash flow must be summed over the life of the well. Present value of well to working interest. Payout occurs in the month when Sum (Dcf) = DCC. This can be found by creating a table of monthly data to see where the payout occurs. Rate of return on investment is the discount rate which makes SUM (Dcf) = DCC at the economic limit of the well. This can be found by successive iterations with different discount rates until the equality is met. It is left to the student to find the present value, payout time, and rate of return on the example. It is tedious work without a computer. An example from the author’s META/LOG program is shown below. 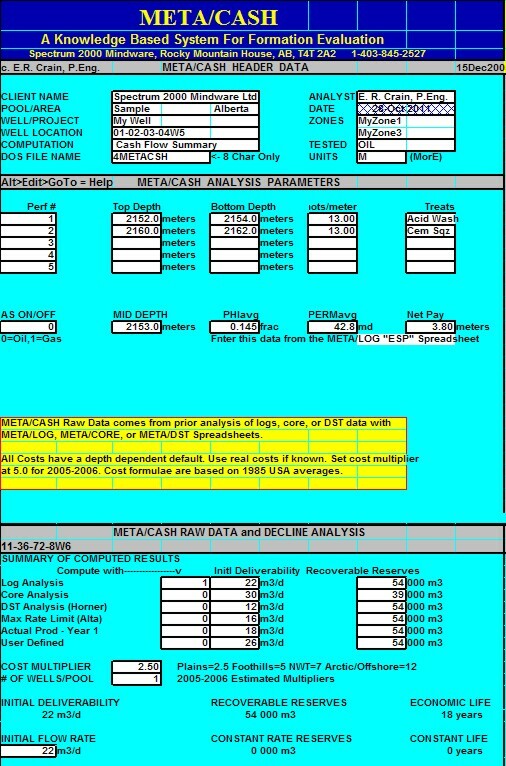 This spreadsheet first estimates a production prediction based on exponential decline, provides for input of costs and prices, then generates a net cash flow analysis. Note that the defaults for costs are obsolete.-You can use the cost multiplier to bring them into line with today's costsm or enter your own data. 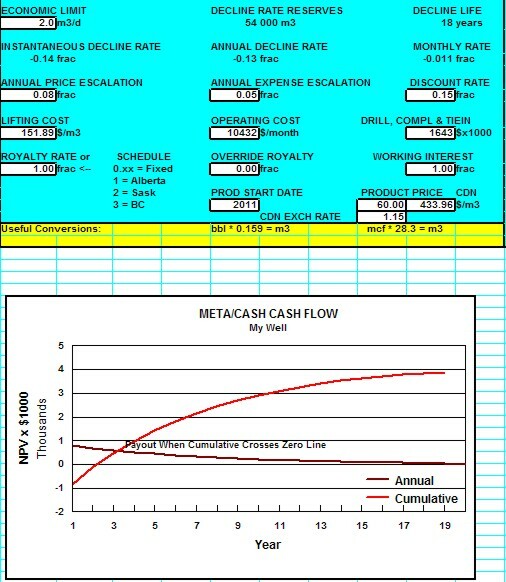 Cash Flow Analysis, includes "Quick Look" exploration-style production prediction and cash flow. English and Metric Units.